You're craving something sweet and savory, and while chocolate-covered pretzels might satisfy your taste buds, you want to eat something with a little more nutritional value. Dried fruit and nuts make a good option. This healthy combo is full of protein, fiber and healthy fats. However, dried fruit and nuts are a concentrated source of calories, so keep your portions under control to help with weight management. Go to the bulk bin section of any health food store and you'll see a plethora of dried fruit and nut combos, from trail mix to tropical mix to high-octane energy mix. For healthier options, look for mixes that include just fruit and nuts. Some trail mixes, such as gorp, contain chocolate. You also want to select a mix that doesn't have any added salt to help keep your sodium intake to the recommended 1,500 milligrams a day. Although the calories vary depending on your choice of mix, a 1/3-cup serving of dried fruit and nuts can have 130 to 190 calories, making it a calorie-dense snack choice. Eating more calories than you need leads to weight gain. 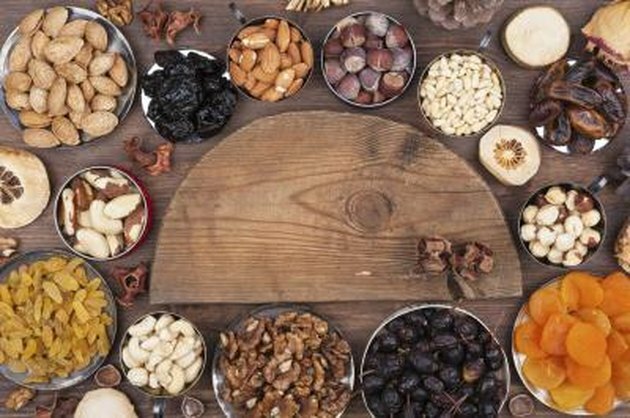 To help keep calories under control when snacking on dried fruit and nuts, don't eat from the container. Instead, preportion your mix into 1/3-cup servings. Dried fruit and nuts are also a high-fat snack, with about 5 grams of total fat per 1/3-cup serving. However, most of the fat in the mix comes from heart-healthy monounsaturated and polyunsaturated fats. These types of fats, when used to replace saturated and trans fat, might help lower your blood cholesterol level. In fact, the U.S. Department of Agriculture says including nuts as part of a healthy diet can help lower your risk of heart disease. The portion may be small, but the fiber in the dried fruit and nuts can satisfy your hunger. A 1/3-cup serving of dried fruit and nuts contains 2 to 3 grams of fiber. Fiber in food makes you feel full after you've finished eating and delays hunger. Getting more fiber in your diet, more than 14 grams a day, without changing your usual intake can help decrease total calories by 10 percent, according to a 2001 review article published in "Nutrition Reviews." You should get 25 to 30 grams of fiber a day. Most Americans meet their daily protein needs eating beef, poultry and eggs, according to the U.S. Department of Agriculture. The 2010 Dietary Guidelines for Americans suggests you include alternative sources of protein in your diet, such as nuts, to vary your nutrient intake. Dried fruit and nuts are a good source of protein, with 2 to 3 grams of protein per 1/3-cup serving. How Many Calories Does Hummus Have? Can Cashews Make You Have High Cholesterol?